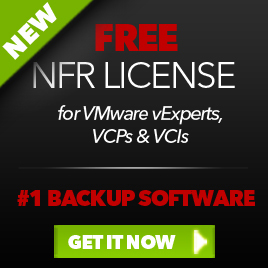 In this quick post I share a Veeam Communities post by rfn and some findings of myself to successfully move the VBRCatalog to a new location. Move the VBRCatalog Direcotory to the new location. The next step is to change the Registry. Open Registry Editor and browse to HKEY_LOCAL_MACHINE\SOFTWARE\VeeaM\Veeam Backup Catalog. Open the CatalogPath key and change the path to the new location. After changing this registry key just search through the registry for other E:\VBRCatalog keys. If you find other keys, just change them to the new location. 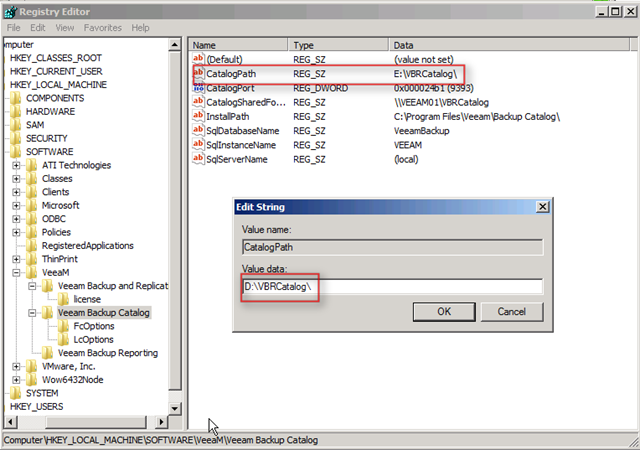 If you don’t change them, you’re unable to upgrade to the later versions of Veeam Backup. If you’re using the Search server, you have to reinstall the Search component to get things working again. This entry was posted in Veeam and tagged Backup 5.0, VBRCatalog, Veeam Communities on April 7, 2011 by afokkema. Device eth0 has different MAC address than expected, ignoring. open the /etc/sysconfig/network-scripts/ifcfg-eth0 in your favorite editor and change the HWADDR to the new MAC address and save the file. The final step is to restart networking via /etc/init.d/network restart. 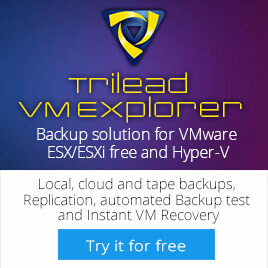 This entry was posted in Veeam, VMware and tagged Backup 5.0, Linux, Veeam on October 27, 2010 by afokkema. Veeam Backup & Replication 5.0 comes with PowerShell extension — a snap-in to Microsoft Windows PowerShell 2.0. Windows PowerShell is a powerful command-line tool that allows administrators to automate some Veeam Backup & Replication activities. Veeam extends functionality of Windows PowerShell 2.0, and now administrators may use PowerShell to automate Veeam backup, replication and copy job creation and editing, VMs restores, replica failover and other operations. Before installing Veeam PowerShell snap-in, make sure that Microsoft Windows PowerShell 2.0 is installed on the Veeam Backup & Replication console. To download Microsoft Windows PowerShell, use the following link: http://support.microsoft.com/kb/968929. PowerShell uses cmdlets — simple single-function commands that can be run in the command-line shell. Cmdlets are specialized .NET classes that implement specific actions. Veeam PowerShell provides a set of its own cmdlets which correspond to actions you can perform via Veeam Backup & Replication UI. 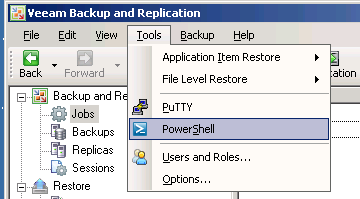 Please keep in mind that actions performed with PowerShell have the same force as actions performed via Veeam Backup & Replication 5.0 — for example, if you delete some job with PowerShell scripts, the job will be removed from the VeeamBackup database, and you will not be able undo changes. 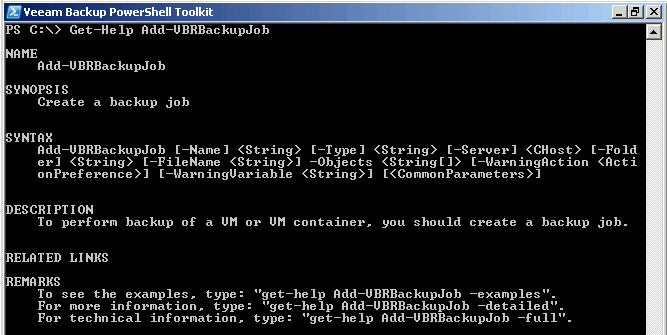 You can expect some more posts about the Veeam Backup PowerShell Toolkit in the coming weeks. This entry was posted in Veeam and tagged Backup 5.0, Powershell on October 26, 2010 by afokkema. 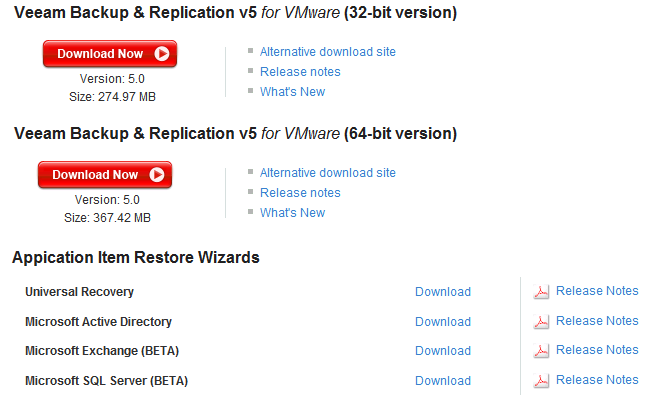 In this post I will show the Setup process of Veeam Backup & Replication v5 with vPower. This entry was posted in Veeam and tagged Backup 5.0, vPower on October 21, 2010 by afokkema.